Fiesta is a runner size Hardanger design worked in the bright colors of a summer’s day. An Intermediate level embroidery, Fiesta is presented within a full color 60-plus page booklet. Within the booklet it is assumed you are quite comfortable and confidence with setting up, and working a Hardanger embroidery. For brush up, click Hardanger and Useful Info sections at the top of this blog page. 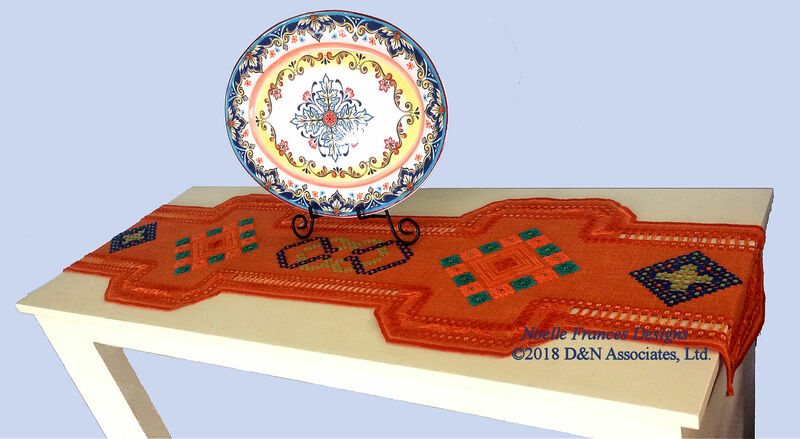 This design incorporates Hardanger satin stitch, Hardanger kloster blocks, buttonhole edge stitch, detached buttonhole stitch, Rhodes stitch patterns, cutwork, bar weaving, picot loops, eyelets and drawn thread work. Review of basic Hardanger stitches and kloster blocks, cutwork, bar weaving, picot loops and the buttonhole edge stitch can be viewed at on the page hardanger stitches within this blog. Working the Rhodes stitch patterns, eyelets, detached buttonhole looped flower petals and drawn thread work are discussed within the booklet. My booklets are divided into sections that discuss the main pattern parts of the design, present full color closeup photos and graphed charts. Runner size, Fiesta design count is 997 by 293. Work area is approximately 46 ½ by 13 ½ inches on 22-count fabric. Click the below photo for ordering or to view the first pages of the design booklet.